As is often the case with artists situated in the mainstream of the contemporary Native North American art movement, Susan Stewart, a Crow/Blackfoot, wears an array of different artistic hats. She is variously a painter, printmaker, installation artist, performance artist, video artist, arts administrator, curator, and self-avowed community activist. Her focus in all of these areas is the articulation of life as a contemporary Native North American. Art and life melded in such a way that they were unrecognizable as autonomous entities and, consequently, there often exists no word for art in most Native languages. This has been carried forward to today as eloquently expressed to her in the words of Crow Sundance Chief Dan Old Elk, one of the elders from Stewart's tribe, "Religiosity and art are integrated into Native existence to such an extent that they are inseparable from daily experience." In 1990, a pivotal event took place in Stewart's life that affected her deeply and shapes much of her work today. She dreamt she was taken to several sites sacred to indigenous people throughout the world. In the dream she questioned why she was being shown these sites. She was told, "the world is out of balance," and that all her questions about the dream would be answered if she would travel "south." Soon after she was approached by Partners of America, and traveled to Argentina to visit the Mapuche tribe. The elders invited her to participate in one of their major ceremonies. During the ceremony she was continually struck by the similarity to the Crow-Shoshone Sundance of her own people. The experience brought her to several significant realizations: that indigenous people throughout the world are interconnected on a powerful spiritual plane, that indigenous spiritual practitioners have the knowledge to restore the balance of our planet, that speaking about her existence as a contemporary Native person through her art work was an absolute necessity, and that she needed to commit herself to helping affect positive change in the perception of Native art and culture. In 1989, together with her late sister Kathryn Stewart, a prolific artist in her own right, Susan co-founded Montana Indian Contemporary Arts (MICA), a non-profit regional Native arts service. 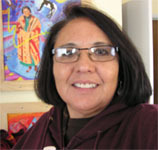 Presently, Susan is the curator of Chief Plenty Coups' Museum in Montana and with her breadth of knowledge and experience, she is consulting and guiding the Art Ranch for its Montana program. "Art Review," by William Zimmer, New York Times, September 26, 1995.